I remember watching this live, and initially being very surprised he missed the shot but at the same time coming back down to earth and feeling as though the expected goal model was probably a bit low on the chance. What’s funny is the associated value is kind of reflective of both these views. The chance itself was an above average but certainly not a “gimme”. There are obviously a few things the model isn’t taking into account that makes things a bit tougher. He gets through on a nice pass by Victor Vasquez but the angle and window to get it past Joe Bendik is rather small. Tosaint Ricketts just pokes the ball with his right foot and with it puts just a bit too much spin on it. Luckily, Jay Chapman was there to drive it back home. Quick shout out to Ricketts. The dude has just settled in as Jozy Altidore’s backup since coming to the team from Boluspor and the Turkish second division in 2016. In nearly 2,000 minutes since he’s averaged 0.58 xG+xA per96 and 10.9 total xG+xA. This is basically equivalent to Dominique Badji, Danny Hoesen or Juan Agudelo in 2017. Heck, Colorado paid Kevin Doyle over a million for below that production and over three seasons. He’s been a steal of a deal and yet another reason TFC is as strong as they are. Wow. Stop me if you’ve heard this before but Borek Dockal (or just insert any other Union player here) just missed out on a point blank shot. Analysis. I’m not going to address this shot. It is what it is and I’m tired of dissecting these Union shots only to have someone just distill it down to “they’re not good." The growing majority of people think the Philadelphia Union are, and you might want to be sitting down for this---bad. Yeah, look, I’m not so sure I buy into all of that. Looking at both expected goals against and shots against they’re fourth overall, and in expected goals for they're seventh. They’ve been really solid, and so far it’s these exact plays that continually end up falling in their opponents' favor that are the difference in them sitting out of the playoffs than in a potential playoff spot. Their PDO, TSR, and GD-xGD all point to the team being both A) unlucky and B) headed back towards positive regression of the mean. It’s not just “one stat” saying this but a collection of various pieces of evidence. What’s more, they’re only 7th overall in the Eastern Conference on points per game, and trail New England by all of three points. I realize that this isn’t a popular opinion and it comes on the heels of me tearing into Earnie Stewart’s time with the Union on twitter. But this team has some really good underlying numbers and their shot creation/prevention process is much better than at any other time in their history. There is the possibility they could continue to get “unlucky” and never return back to the mean, but with how consistent they’ve been at creating good shots, I’m buying belief stock. Still, David Accam has not been the same player he was in Chicago. He’s not getting to the same dangerous spots and he’s not helping to create the same high leverage shots that he was consistently doing for Nemanja Nikolić last year and I’m honestly not sure why. Accam has still been successful dribbling into the final third and at about the same rate as last year. My best guess is that he’s still settling into the Philadelphia attack, that’s also still trying to find it’s own identity at this stage too. This may just need more than two months worth of data to figure out. I’ve mentioned a few times on our podcast how I’m super glad the Timbers have found a way to keep Fanendo Adi, but he’s also not been as “dominant” as he was the last few years. That’s partially because he’s not quite creating as many shots, and he’s not getting as many shots on target. Shots on target are rather chaotic but that’s discussion for a different different day. Adi puts this basically on frame, or probably does, with Tyler Miller managing to derail the opportunity with his sliding save. The shot or save isn't nearly as impressive as the build up. I’m not sure what the heck Walker Zimmerman is doing here or has been doing for the season in general, but it’s not been much. Adi runs the show here with Zimmerman not so much as even raising an eyebrow. This season hasn’t exactly been the promising restart we all thought we would see for the former FC Dallas centerback who was also recently called into USMNT camp. 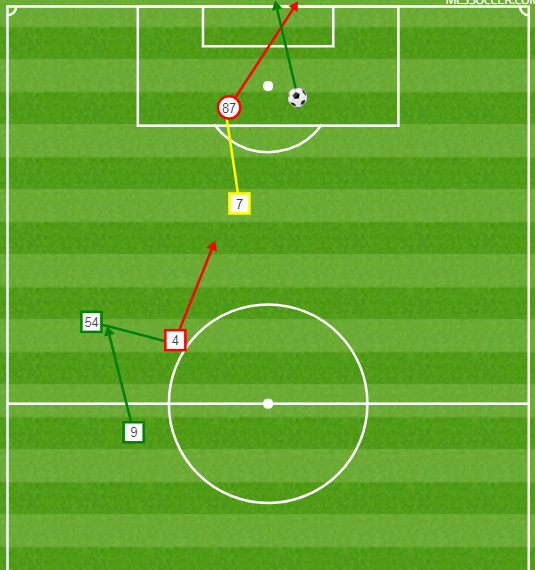 Okay, MLS chalkboards don’t have the “shot” event occurring and the GIF replay is pretty shaky. It’s obviously an opportunity for Chicago but I don’t think it’s nearly as dangerous as the expected goal value would suggest. A glancing header or shot without pace is obviously a different caliber of problem for any given keeper. The best thing going for it is that no one really understands what’s happening after the ball is passed into the box by Rafael Ramos. Sometimes, that’s okay. At times chaos is the best facilitator of goals. Approximately 100 viewings later, it almost looks like Nemanja Nikolic gives it a little bit of a taper with his right foot but right at Joe Willis who deflects the shot out of the box. It’s a bit hard to see as Nikolic has his body between the camera and the ball. All we have is the result of the save. It makes this one a bit hard to diagnose in general. I feel like this sequence has been a common scene on this column. A pass is sent across the face of goal to a player just inside the six yard box. The individual tries to redirect it to the back post but just misses out. The problem with always focusing on these misses is that we see all these unsuccessful results and we miss the point of it. The reality is regularly creating these types of shots is more indicative of a successful team, and guys like Jordan Hamilton or Ryan Telfer or whoever else is helping to create the chance will also be regularly assisting on goals. 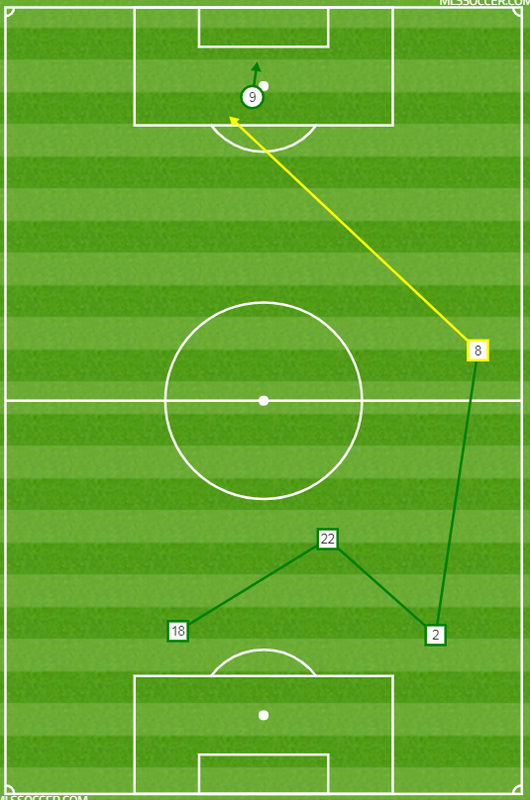 Also, Telfer had himself a game against Orlando, didn’t he? Forget about his first professional goal, which stole all three points in Toronto’s favor, this one v one against Will Johnson is hilarious and something I’d expect to see from someone who has been in the league for years. You have to appreciate the overlap and then cut by Reggie Cannon. What makes it even more interesting is that you can see him get the shot off almost while transferring and redistributing his weight. The end placement of the shot is so good, but the shot itself is also impressive. Also in news concerning Reggie Cannon. In all honest it’s probably not real news. As Dummy Run points out below, this is probably less important to the players and would more impact the coaching and training staff. Nah I'm saying the same thing though. What the analytics team is looking at and how that information gets translated to players can and maybe should be wildly different. Maybe players see numbers, maybe they just get yelled at by a better informed coach.